T and I were talking about Baked Alaska — he has never had it before — and I thought, “I wonder where the name came from…” et, voila: blog post. One of my J-school classmates invited me to an olive oil event at Delmonico’s not that long ago. So I am still enjoying my free bottle of Delmonico’s brand oil from Croatia. 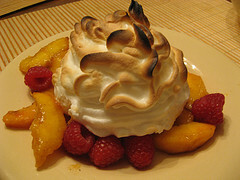 I also think it would be fun to try my hand at Baked Alaska sometime (although probably only once). If I did, I’d probably use this recipe for Strawberry Baked Alaska, but substitute raspberry sorbet and ice cream. Or — ZOMG! — this Coffee Baked Alaska with Mocha Sauce. Wow! Pom Wonderful, a producer of pomegranates (and juice by the same name), has filed a lawsuit against the FTC over truth in marketing, according to a story last week in Ad Age. Pom says the FTC’s recent regulations to curb false marketing hinder its First Amendment rights. 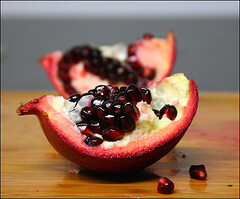 Pom’s ads say its pomegranates have beneficial polyphenol antioxidants. (I’m not exactly sure what they do. Wikipedia wasn’t much help. But, colloquially, we can say that antioxidants are good, right?) However, the new standards require a company to get FDA approval before making claims about any health benefits. Pom’s complaint says this bans both deceptive and non-deceptive speech. As a consumer, I sometimes rely on claims made on packages to make purchase decisions and I sort of assume those statements are true. (When I interviewed some bigwig scientist guy for my master’s project, he told me he was developing a nutrition rating system for this very reason and used bread as an example — it’s hard to decipher all those competing claims, right? So his point was that a universal rating system would make it easy to see which bread was most nutritious, etc.) 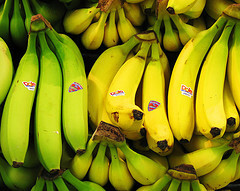 So…as a consumer, I think forcing companies to put their money where their mouths are and get FDA approval doesn’t seem like such a bad thing…and then I argued that doing a post on this topic would give us an opportunity to ask readers for their input and whether they think Pom is the victim of an overzealous FTC or if food companies really should get FDA approval before they make health claims? But now I can ask you instead! Fire away.